This stylish and athletic, multi - purpose retriever has strength, endurance and presence. The Curly is recognized by most canine historians as one of the oldest of the retrieving breeds. Developed in England, the Curly was long a favorite of English gamekeepers. 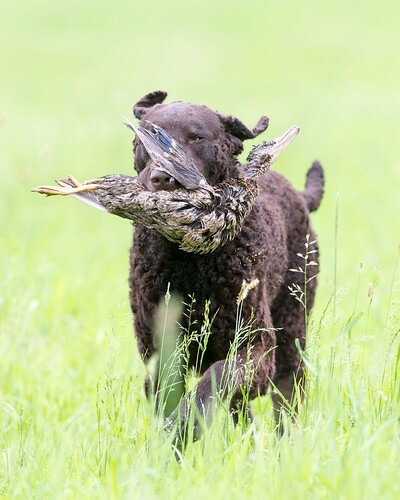 Prized for innate field ability, courage and indomitable perseverance, a correctly built and tempered Curly will work as long as there is work to be done, retrieving both fur and feather in the heaviest of cover and the iciest of waters. To work all day a Curly must be balanced and sound, strong and robust, and quick and agile. Exceptional swimmers, which revel in the water, these powerful and tireless hunters excel on all game. Exciting to shoot over, yet they are a delightful family companion. Self-confident, steadfast and proud, this active, intelligent dog is a charming and gentle family companion and a determined, durable hunter. The Curly is alert, biddable and responsive to family and friends, whether at home or in the field. Of independent nature and discerning intelligence. Each of the Retriever breeds, even though closely related, has distinct habits and temperaments, and the Curly is no exception. Curlies are very much loyal family dogs and are reserved with strangers. They make excellent watch dogs because of this characteristic. They are generally a dignified and somewhat independent dog, especially as compared to the Golden Retriever and the Labrador Retriever. 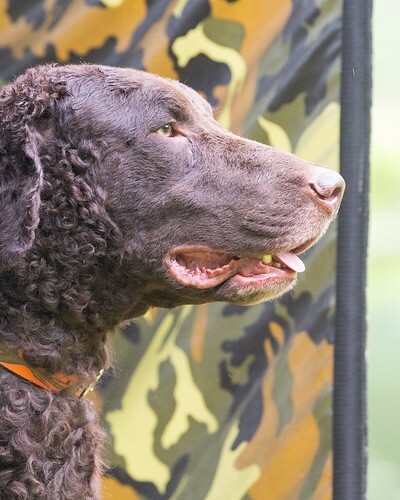 Like the Flat Coated Retriever, Curlies come in both black and (recessive) liver colors. There have been occasional reports of yellow Curlies, but this has never been an accepted color in the breed and very few if any yellows occur today. JH - Junior Hunter - This is an AKC title that is earned by receiving 4 passes at the Junior level in a licensed Hunt Test. This is the beginning level in the AKC Hunt Test program. SH - Senior Hunter - This is an AKC title that is earned by receiving 5 passes (4 with a JH title) at the Senior level in a licensed Hunt Test. This is the level at which most hunting retrievers run. SR - Started Retriever - This is the entry level NAHRA title. This title is earned by acquiring 10 points. At this level, a pass is worth 2.5 points. 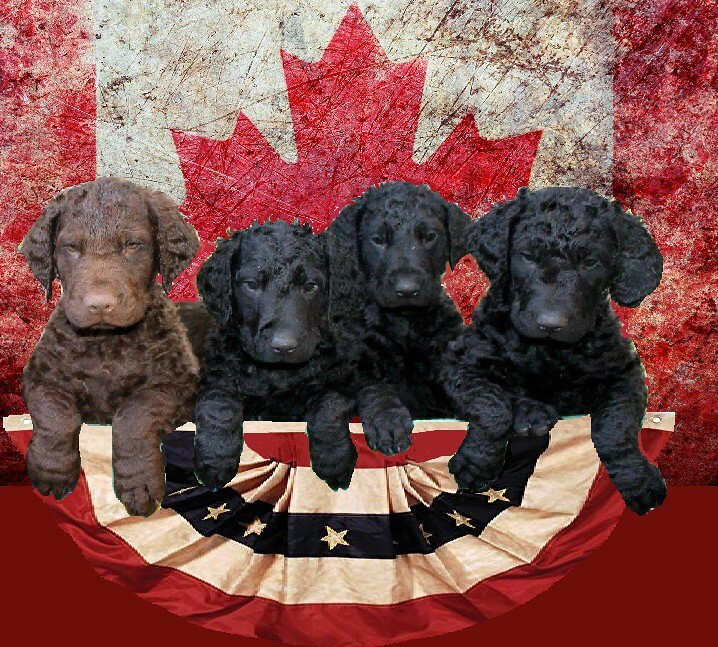 WC - Working Certificate -Curly Coated Retriever Club of America Award. The land test shall be a single, consist of a freshly killed bird thrown 40 to 50 yards from the line in light to moderate cover. The throw shall be accompanied by a shotgun shot either live shells or blanks. The dog need not be steady and may be restrained. The water test shall consist of back to back singles, using ducks, in open swimming water. The first bird shall be thrown 25 to 35 yards from the line, accompanied by a shotgun shot. The bird must be visible from the line when in the water. The second retrieve will have the same requirements as the first except it must land approximately 60 degrees or more from the first retrieve and be in light cover. The line may be moved so that the fall will be in a different area from the first retrieve. Puppies will carry nearly anything they can get hold of, including your good shoes, gloves, the children's toys, and your newly-planted rosebushes. Severe scolding now, or vigorously discouraging the retrieving instinct, will quite likely result in a dog hesitant to retrieve for you later in obedience training or field work. A much better solution is to call the puppy to you (go to him when necessary), praise him gently for delivering and releasing the forbidden object, and immediately give him one of his own toys to carry and play with. If you chase him while screaming and scolding, he will only run away with the object ... and next time, may just quietly take it away to be more thoroughly "investigated". 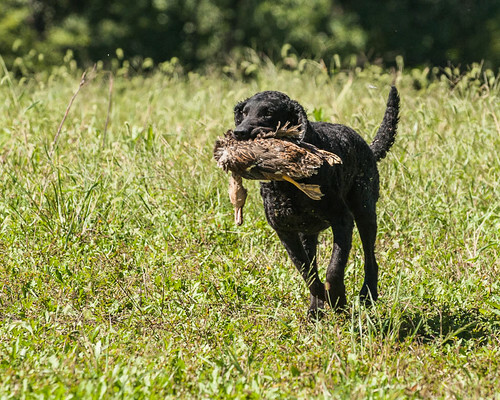 One of the most characteristic features of the Retriever is the instinct to retrieve, and the commitment to carrying things around. 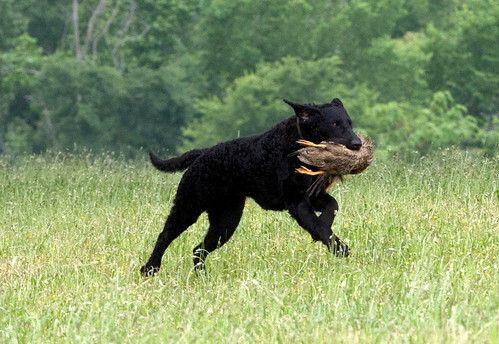 Even if tennis balls and toys are the only "birds" your pup ever retrieves, but especially if you plan to do any sort of hunting, field work, or obedience work, proper development and encouragement of the retrieving instinct in your puppy will be a firm foundation for not just retrieving skills, but also the willingness to work with and for a person. Use a small, soft object that's easy for the puppy to carry such as a rubber ball, a knotted sock, a pigeon wing, or a puppy-sized bumper. Show it to the puppy and move it in a wiggling motion that will entice her by awakening her chase instinct. Don't move it too quickly as puppies often don't follow movements that are too fast or abrupt, and it is important that she maintain eye contact with or "mark" the object. While she is watching the movement of the object, or attempting to take a hold of it, encourage her with soft but excited words such as "Where's the bird? Good puppy!" and toss the object a foot or two away. Use words of encouragement such as "Fetch it up! Good puppy!" as you call her back to you with the object, hold her gently while you praise her again both verbally and physically, and don't take the object away too soon. Many puppies are reluctant to give up their "catch", and run away from you with it instead of bringing it back. Resist the impulse to run after the puppy, and run away from her instead, clapping your hands, and calling her by name; this should once again initiate her "chase" instinct. Take the object from the puppy very gently (praising all the time), and let her retrieve again immediately. 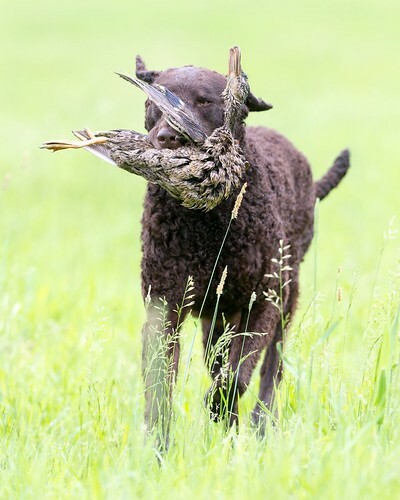 When the game is over (and two or three retrieves is plenty), take the object from her, hold the puppy there for few more seconds of praise, and then release her. 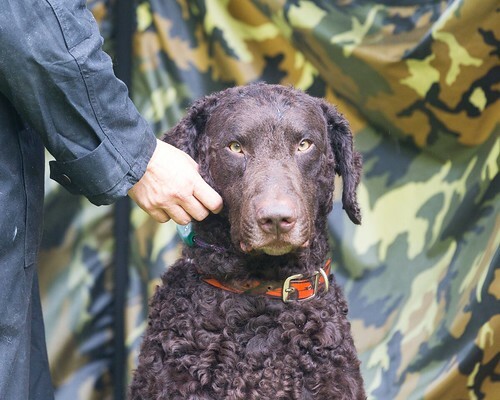 If you are thinking of doing any type of retriever work, or hunting with your pup and you don't have a clue where to start, I suggest finding a local retriever club in your area. You can also purchase a number of good books and videos to help guide you.